I’m sure you’ve seen the trailer. If you haven’t, scroll down and check it out because it is NOT TO BE MISSED. What am I talking about? 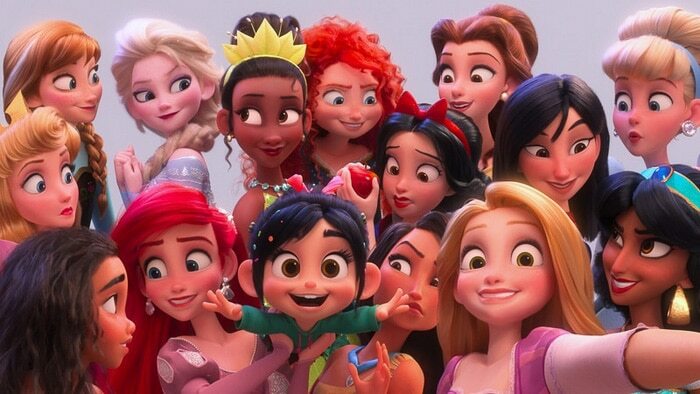 The Disney Princess Scene in Ralph Breaks the Internet. If you’ve seen the clips, you probably already love it. There’s so much to it and it all happens when Ralph and Vanellope visit a place called Oh My Disney. To know the Disney Princess scene is to know the amazing work of OhMyDisney.com and I’ve got some fun facts to share from the creators of this amazing world and the incredible addition to the world of Disney animation! Thanks to Disney for providing me with an all-expense paid trip to LA in exchange for my coverage of Christopher Robin and Ralph Breaks the Internet. 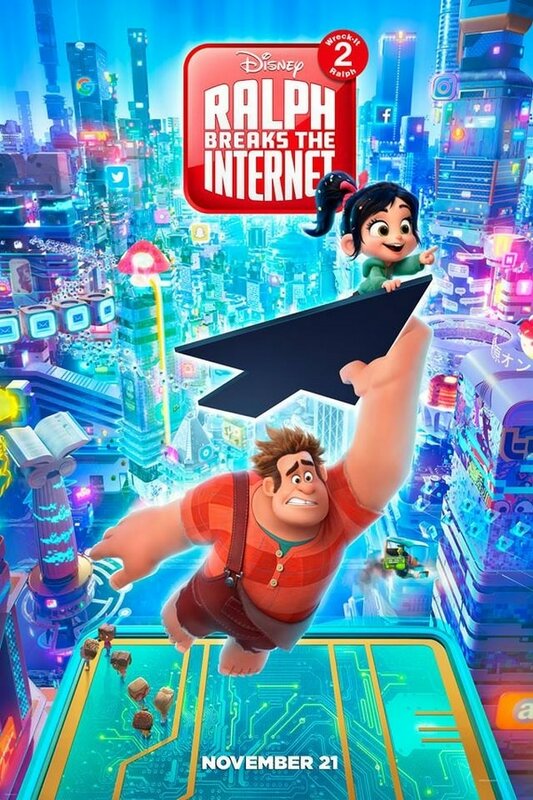 As part of my trip to LA to learn more about Ralph Breaks the Internet was created! I’m a huge Wreck-It Ralph fan so this was an amazing experience for me. The movie opens in theaters THIS WEDNESDAY, November 21st and my family already has their tickets! What a fun thing to do together on the weekend after Thanksgiving! But let’s get down to the fun stuff. If you love what you’ve seen of the Disney Princess scene (see the trailer below around the 1:35 mark), then I think you’ll be a huge fan of Oh My Disney! 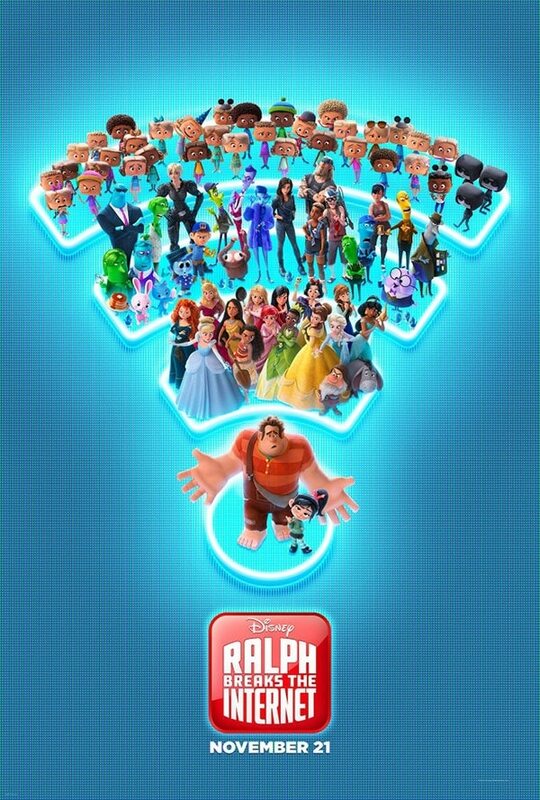 Oh My Disney is a part of the Internet that Ralph and Vanellope visit in the movie. But it’s also a site we can all visit for all things Disney! Check out OhMyDisney.com to learn more about the new characters in Ralph Breaks the Internet, take fun interactive quizzes (want to find out which Disney Princess you are or which Ralph Breaks the Internet character you are? ), and learn about other the other new movies coming soon! Basically ALL THINGS DISNEY! But in the film, it’s also a destination spot, the place where our favorite princesses can be found, and just one of the coolest places to visit! Is he an Elsa or an Anna? 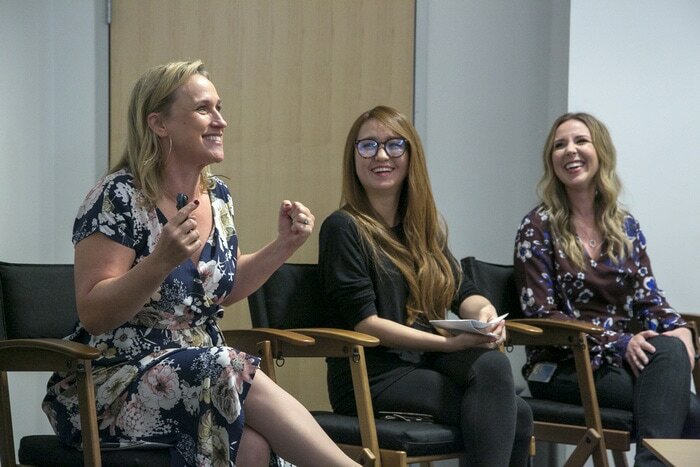 We met with three of the amazing ladies who worked on Oh My Disney and the princess scene. They shared that the princess idea was one that wiggled its way in and out of the movie over the years of working on the project. The finished scene in the movie is slightly different but is important to the story and for their friendship. I think we’re all going to be big fans once we see the entire scene! I love how the general idea was always around and that it actually made it into the finished film! A ton of research when into the Princess scene. The team spent time at Disneyland and met with the princesses. They interviewed them, watched their mannerisms, and learned more about what defined each one. They wanted to update the princesses so they all looked like they could truly exist in the same space. This meant that some redesign had to take place. The original actresses also met with the team to talk about the characters. So much of what comes across in those films is part of the actresses. They each did a little Q&A with the animation team. The animators soaked up what the actresses brought to their characters and worked on finding a middle ground. The animators had all grown up watching the films and being inspired by them. So they shared that it was really special. The actresses all sounded so much like their characters still and were able to go back into their characters. They embody the characters and uphold/protect the characters. They added a lot to the scene and the animators were very grateful to have had the original actresses involved in the creation of the project. The team shared more about how they had to create the princesses that all exist in the same world. They had to take older characters and bring them from 2D to current animation. If you’re thinking this sounds like a tricky process, you’re right! Different artists drew full sets for different princesses and then pulled them together for the current design. The goal was to modernize the princesses without losing the characters we know and love from their original films. Mark Henn was the supervisor of five of those original princess movies! No one knows these ladies better than Mark! He helped make sure filmmakers were being as authentic as possible. I love the teamwork that happens on Disney films! The team wanted to pay homage to the original films when they could. These are the details that really bring the Disney Princess scene to life for me. Once they had the updated looks for the princesses, they had to dress them! If you know anything about this scene, you know the princess all got new, casual, and modern looks that we’re all drooling over! Originally they designed pajamas for each princess but then felt like it was too relaxed of a look. So they turned to our star for inspiration! Vanellope’s clothes (my favorite!) were the inspiration for the new casual princess looks. Be sure to pay close attention and check out all of the shirts. It wasn’t just the design team that came up with the ideas! The entire crew submitted ideas! How cool is that? Each princess wears a shirt that references her own film, so have fun figuring them all out! It’s one of those details that makes Vanellope’s visit to Oh My Disney and her run-in with the princesses that much cooler! 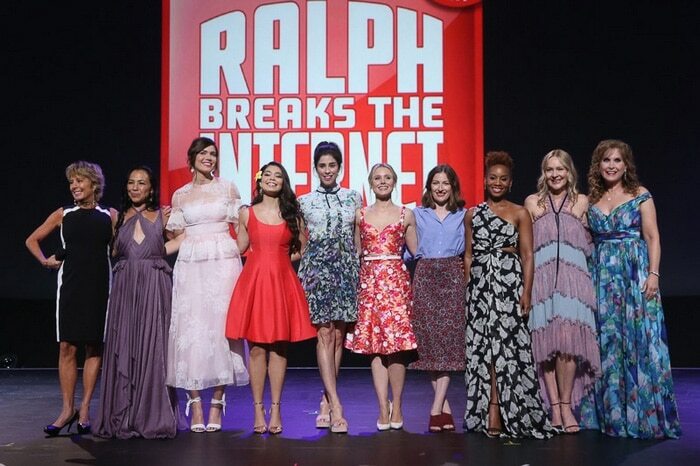 Be sure to get your tickets now and take your little princesses and princes to see Ralph Breaks the Internet! You don’t regret it! CONNECT with Ralph (on the Internet)!